From the first line of this famous tenor aria from Act I of Puccini’s Manon Lescaut we know exactly what this character is thinking: ‘Never before have I seen such a beautiful young woman!’ (Donna non vidi mai simile a questa). 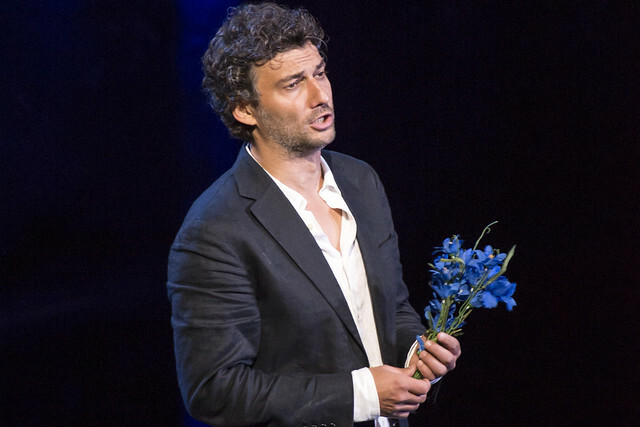 The Chevalier Renato des Grieux, who sings it, has fallen head over heels in love with the gorgeous Manon Lescaut. In this lyrical and impassioned solo, Des Grieux thinks how fervent he’d feel telling her that he loved her; her name touches nerves deep inside him; he does not want the memory of her whispered name ever to fade. Strong stuff! And it needs a musical setting to match – Puccini marked the aria ‘con accento appassionato’. The melody for the first eight bars constantly yearns to rise, shown in slowly ascending phrases punctuated by sudden single high notes. In fact the second highest note of the whole aria – a top A – is reached as soon as the start of the fourth short phrase. This is important, because everything about the music needs to be heightened to reflect the sensation of love that has overcome Des Grieux. What’s more, it was love at first sight – he only met her a few minutes ago! At the start of the opera Des Grieux was an unattached young man, detached from playing romantic games. He knew nothing of love, dismissing it as a tragedy and a comedy, but he went along with some mock-flirting with a groups of girls. He wasn’t serious, so when he finished everyone laughed. But then Manon Lescaut arrived on the scene, beautiful and unknown. Des Grieux was instantly captivated by her: love at first sight – genuine passion, something completely new to him. So he introduced himself. There is something tentative about the music for his approach as he couldn’t know how she would react. The melody of this introduction becomes the main theme of ‘Donna non vidi mai’. At their first meeting, he also asked her name, and she replied with a memorable descending phrase to the words ‘Manon Lescaut mi chiamo’ (I’m called Manon Lescaut). The first words she said (sang!) to him lodged in his mind, and so in ‘Donna non vidi mai’ he repeats this phrase – music and words – twice. The first time is quiet and relatively low, starting on an E flat and falling away to the second lowest note in the aria. He is recalling her quiet, shy reply in every detail (the music is marked ‘con semplicità’). But he loses all restraint through the effect she has had on him, and his vocal lines swell in volume and keep rising in pitch – up to a top B flat as he sings of the passion she inspires deep in him. He repeats her ‘name’ phrase, now high and loud, ‘con anima’. Throughout the aria, the music moves in broad waves from quiet to loud, from low to high in the melody, from quiet orchestration to forceful. It is a musical description of Des Grieux’s release from emotional restraint under the transformative sensations of his instant attraction. The music repeats the same group of phrases and ideas as Des Grieux re-lives this unexpected and intoxicating meeting. The music is slow and stretched out so he can linger in every pleasurable moment. Their short first exchange was enough for him to ask her to meet him again, and for her to say she would, so Des Grieux is also singing with a sense of expectation that she will soon be back! This aria is not just a wonderfully lyrical and romantic soliloquy, but dramatically sets up the whole story. Des Grieux’s overwhelming love for Manon is so strong he defies all sense and follows her destructive path – ultimately to be taken down with her. But all that is yet to happen. As Des Grieux sings ‘Donna non vidi mai’, he is full of hope, anticipation and an all-consuming passion for Manon Lescaut. Here's another example of what I call translator's and subtitler's wilful re-writing In what is otherwise a fascinating article! Des Grieux actually says "I have never seen a woman such as this!" The whole point of the aria is that he has fallen in love with MUCH more than just Manon's beauty. It's a much more subtle aria as your article does indeed suggest, which makes your re-writing of Puccini's actual words even odder! I look forward to seeing how the subtitler deals with the translation on Tuesday! Ah, but I think the music gets there first! The melody that later turns into ‘Donna non vidi mai’ is played just before Des Grieux exchanges his first words with Manon. To me, the catalyst for Des Grieux’s visceral response is her appearance. Manon’s character, especially her self-destructive aspect, has not yet been revealed. Language in librettos conveys only part of the story – stage presentation and music complete the meaning which is why there are many different interpretations of the same texts, whether in the original language or in translation. When discussing the whole effect, single opening lines (used as unofficial titles for so many opera extracts) can’t always get that wider dramatic context over concisely and clearly to a reader through literal translation alone. But the way the libretto contributes to how we interpret opera is a really interesting and important one – so thank you for raising it. Thank you. Although I agree with some of your reply, the melody that starts just before DG exchanges his first words with Manon does in fact become not only "Donna non vidi mai" as you write, but the whole statement "Donna non vidi mai simile a questa" as well as the next two lines before he repeats Manon's name. What Puccini is doing in planting this whole 8 bars of melody in our minds before the aria is sung, is in my view, presaging the fact that, although he may not yet know it, DG is actually going in love with something much more than just a pretty face. That's why his response is so visceral indeed: it is far more than just lust. I feel it is simply wrong to translate this opening line so trivially as "‘Never before have I seen such a beautiful young woman! "as Puccini did NOT write "Donna si bella non vidi mai"!!! In fact, in his aria, DG does not actually refer to Manon's beauty at any point. Translating the opening line as "I have never seen a woman such as this!" is far from a literal translation which does not get over the dramatic and wider context. Inserting a reference to beauty is wilful, subjective, inaccurate and ultimately misleading. Puccini is telling us in advance that this is no ordinary love story.